The Galway Alliance Against War has set itself the task of explaining to Galwegians what PESCO actually means and aims to deliver a bilingual information leaflet to every home in Galway. 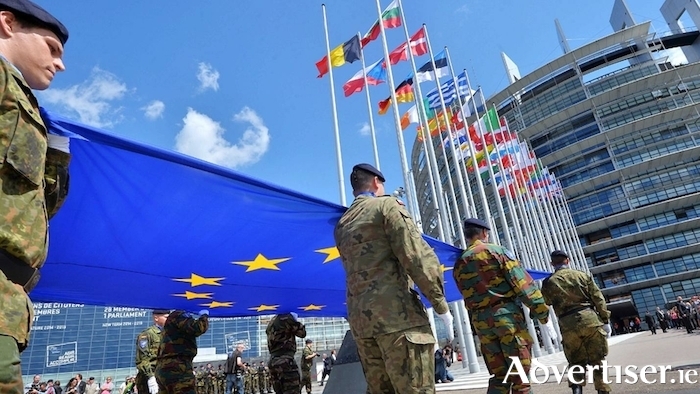 PESCO stands for Permanent European Security/military Cooperation in which 25 of the 28 national armed forces pursue what is called "structural integration". In the words of Article 42.6 of the Treaty on European Union: "Member States...which have made more binding commitments to one another in this area with a view to the most demanding missions shall establish permanent structured cooperation within the Union framework." For many, this is the building blocks towards the creation of a European Union army, something the EU denies. However, Ireland's participation in PESCO, rushed through the Dáil in December 2017, will require the State to dramatically escalate its military spending. GAAW spokesperson, Niall Farrell, told the Galway Advertiser: “The cost of PESCO will put the price of the Mater Children’s Hospital in the ha'penny place. At present, Irish defence spending is €960 million per year - 0.3 per cent of our gross domestic product. Under this EU military agreement we have to aim to spend over six-times that amount on weaponry each year. In other words, two per cent of GDP." Mr Farrell points out that, even if the State were only to up our military spending to one per cent of GDP, "our defence bill would be a colossal €3 billion per year". He said that extra €2 billion "could be better spent on housing, health, and public services" rather than being "squandered on integrating" the Irish Defence Forces with the other EU member state armies. GAAW will be holding an information stall on Shop Street this Saturday, and asking people to sign its petition calling on the Government to rescind its decision to join PESCO.